Out of the factory, most vehicles only include one starter battery. Understandably, people often want to add a second battery. It could be for work lights, an audio system, a power winch, or even for the sake of having a backup. If you’ve ever entered your car on a cold night, and felt relieved when your engine actually turned over like it should, the component you need to thank is probably a battery isolator. A good battery isolator works as a kind of rule-enforcer for battery systems. They allow DC power to flow through the isolator, while forcing electricity to flow in only one direction. That way, when one battery in your bank is drained, it won’t end up pulling current from another. Perhaps more importantly, ending up with the wrong detector could be more trouble than its worth. You don’t want your battery isolator to cause problems with your vehicle’s electrical systems, or with the devices connected to whatever local grid you’re working on. Luckily, it’s not that tough to choose an effective battery isolator. If you’re planning on running a giant battery bank, filled with hundreds or thousands of batteries, then you’d need a pretty impressive isolator. But for someone seeking a simple two battery solution, what you’re looking for is a dual battery isolator. Expanding beyond two batteries isn’t only prohibitively expensive, it’s totally unnecessary in most circumstances. Seemingly simple features, like start isolation, can ensure that your sensitive electronics won’t be subjected to the kind of sags in voltage that may occur when engine cranking happens. Isolation aside, different vehicles have different batteries. Different batteries have different needs. You want isolators rated to carry the amount of voltage and amperage you expect to draw. For the better battery isolators on the market, these typically range between 120A and 150A. Though you can find more powerful kits for niche scenarios, most people will be well-suited by almost any properly constructed battery isolator. Systems with more robust batteries should take advantage of equally robust supporting equipment. You’ll have to choose between diode isolators or relay isolators. Each have their own advantages and disadvantages. A diode isolator is positioned between your alternator and your batteries, and the built-in diodes let your alternator charge those batteries while keeping them both isolated from each other. That lets you connect with the secondary battery without having to discharger your starter. Moreover, installing a diode isolator is pretty simple because there are no moving parts. It’s almost as simple as placing the unit. But the heat sink for these types of units tend to be larger, and voltage drop among the diodes can lead to undercharging your batteries if you’re not careful. Similarly, an isolator relay diode is also installed in a position between your batteries and the alternator. The relay switches on or off depending on the status of your ignition. These relays tend to be very small, and they don’t lead to voltage drop among your contacts. The only downside is that you have to actually wire the relay into your ignition circuit. Because moving parts are involved, you’re going to encounter more issues related to wear-and-tear. 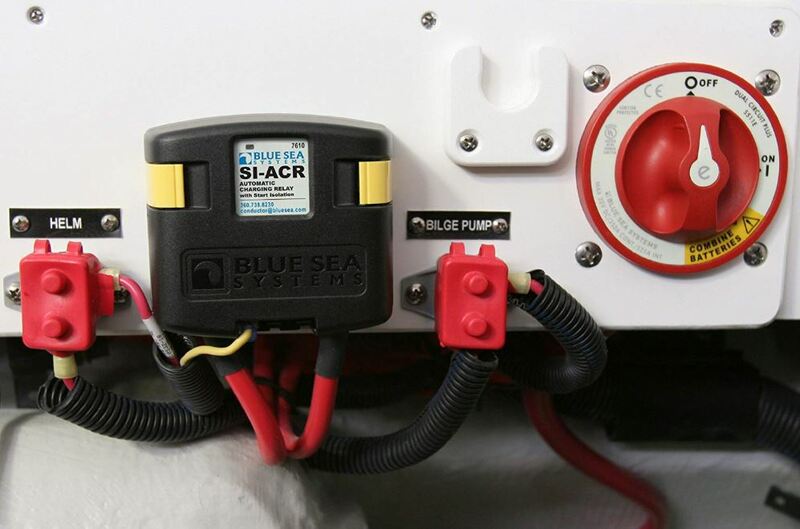 The Blue Sea Systems kit lets you share the charge between both of your batteries with great efficiently, far more efficiently than any single battery isolator. The 12/24 Volt SC 120 Amp Automatic Charging Relay can be used to isolate batteries during an engine cranking up, or used to combine batteries during charging. Essentially, these devices are made to try and simplify the switching process. Consequently, they work just like you’d expect, by isolating an engine or house circuit. Though the Add-A-Battery kit does have a minor automotive slant because these switches are supported by a start battery which can be used for emergency starting. The 65A ACR is great for automatically charging a pair of battery banks from a single engine alternator. And Blue Sea Systems makes it easy to get the job done right with the understandable control interface on the front side of the unit. The components which come into contact with electrical current are tin-plated copper studs, used for optimal conductivity and their resistance to corrosion. The unit is further protected by a weatherproof chassis, specifically allowing the charger to be IP67 waterproof. That’s one of the higher waterproofing certifications, so it’s rated to survive temporary submersion for up to a couple of feet. The battery component measures roughly 2.5 x 4 x 0.5-inches, while the starter component has a diameter of roughly 4-inches. Blue Sea Systems also has a 65A DC unit for people who don’t need quite as much power as this 120A DC unit can provide. But the pricing between the two is nearly identical, so you’re probably better off spending a couple extra bucks for the 120A DC unit. Always nice to have some room for growth. The included battery is an E-series dual circuit battery, which is intended to survive considerable wear and tear. However, you may need to replace this battery system after a decade of steady use. It really depends on how well you treat the internal battery. The Battery Doctor is pretty close to state of the art equipment. This dual battery controller is ideal for basically any vehicle that has an auxiliary battery. The Doctor is somewhat smaller and lighter than similarly powered controllers, which probably reflects the automotive spirit of this device. The Doctor is highly portable, measuring 5.1 x 5.7 x 2.3-inches, and weighing pretty close to one pound. It’s basically like a tremendously thick smartphone. The WirthCo 20092 Battery Doctor is also IP62 water resistant, which makes it suitable for outdoor use. WirthCo claims you could use this device in a marine capacity, but you may be better off securing a greater waterproof rating for those kinds of jobs. Like you would expect, the Doctor offers priority charging for starting up a battery, and will automatically charge any auxiliary battery you connect. The Battery Doctor can also offer a manual override solution for starting a kit from scratch. Using the Doctor is pretty easy, too. When the blue light comes on, it indicates the primary battery has bene connected and the alternate is charging up. That will happen when the ignition is on, and the battery is operating with at least 14-volts. The little blue LED will stay on until isolation is compete. But with one push of the reset/override button, you can swap the batteries to parallel mode, to use for jump-starting. The included installation diagram is black-and-white, but it’s clear enough to give you an idea of how things should be laid out. And it reminds you about the future accessibility of your components as you position them, so you don’t accidentally turn an easy setup process into something that requires reinstallation and adjustment. The included instructions are also laminated, which is a nice touch. The lamination helps them hold up well when posted in workshop environments. 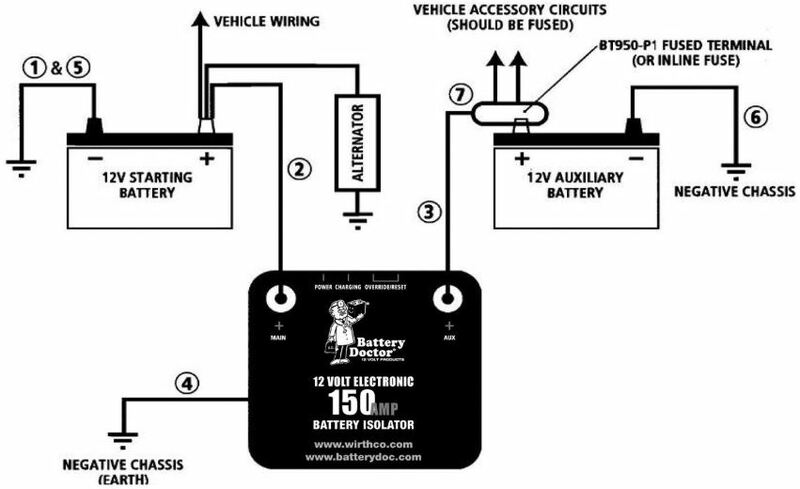 They also provide specifications for the Battery Doctor, which can be useful if students or inexperienced users are trying to make sense of it. The Battery Doctor includes a handy 4 x 4 x 2-inch mounting bracket. You can use it to house the isolator. The Battery Doctor also includes surge protections and over current protections for working on vehicles with sensitive electronic systems. It’s tough to make an impressive battery isolator, but the KeyLine Chargers Isolator gets close. It allows you to keep your amperage output up, and in a way that solid state devices generally cannot. The VSR in this unit will cut-in at 13.3 volts, and then gracefully cut-out when you approach 12.8 volts. In other words, it will help keep your battery perfectly charged, so the next time you throw on the power, your battery behaves exactly like you expect it to. The 140 Amp Dual Battery Isolator is intended to provide everything necessary for charging a two battery system. That includes the ability to separate power sources for your batteries, even though you’re only using a single alternator. This highly compact isolator was constructed to be small enough to place essentially anywhere you’d want an isolator. It measures 2.6 x 2.6 x 2-inches, which is certainly not a cramped fit under the hood. In any case, you can get the equipment close to your dual battery setup. KeyLine Chargers Isolator has been IP65 certified for off-road use. Whether it gets dusty or wet, you’re pretty well covered. But the IP65 certification isn’t rated for submersion. It’s more like protection from rain and light spraying forces. Don’t consider this isolator to be totally immune from water and it shouldn’t become an issue. The generally sturdy construction of the isolator paired with the thick and well-protected cabling makes these systems ideal for enduring vibration. If you stick to the instructions, setting up is basically as simple as placing the power-in wire and the power-out wire. 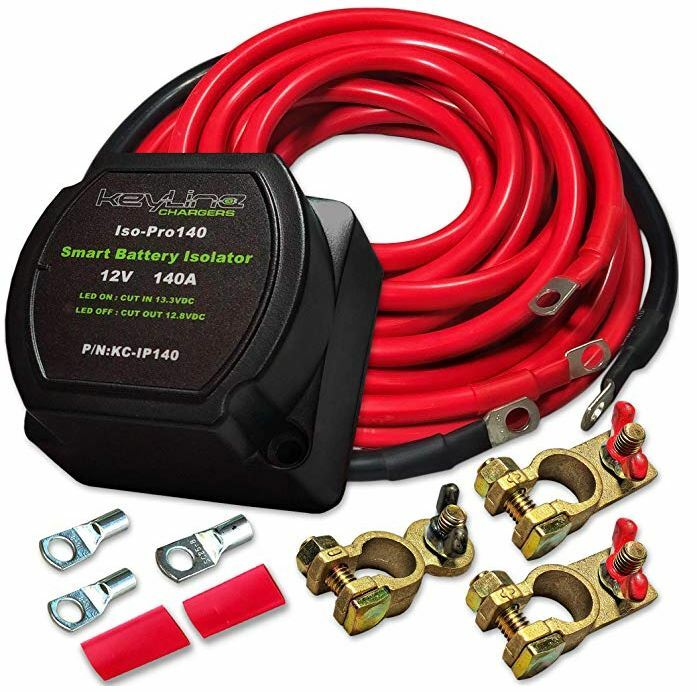 The 140 Amp KeyLine Chargers Isolator VSR includes a 20-foot battery cable and a two-foot battery grounding cable. The former is red, while the latter is black. The color identification makes things a little simpler for people who aren’t certain what they’re doing. If you’re a novice user, you may not find the instructions sufficiently enlightening. They do not take great care to define terms. But then again, KeyLine makes it tough to get lost. Color coordinated cables can guide along most people, and making those cables different lengths can help guide everyone else. This isolator includes brass marine type battery terminals, negative brass marine type battery terminal, tinned copper lugs, a heat shrink, and a handful of cable ties. KeyLine Chargers Isolator also includes a one-year warranty, though it’s seldom needed for this type of equipment. There aren’t exactly a bunch of different moving parts that you need to worry about breaking. As long as you can manage to do a clean install, it’s clear sailing. 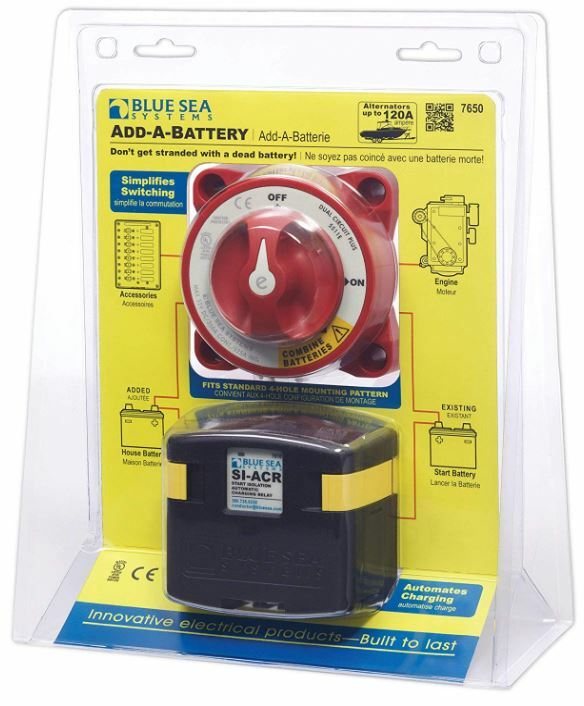 The Blue Sea Systems Add-A-Battery Kit is both basic and powerful. Whether or not you intend to use the isolator for automotive purposes, this system is intuitive to use, and powerful enough for almost any dual battery setup. This kit is somewhat on the expensive side, but when you want high quality equipment, you typically have to be willing to pay for it. 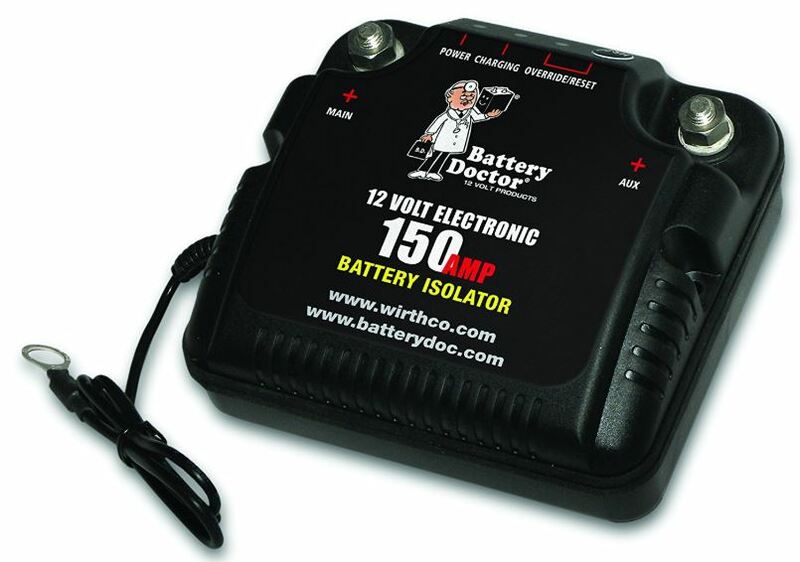 The WirthCo 20092 Battery Doctor is something that nearly any mechanic could use in their shop. But you don’t actually need any serious level of expertise to use the Doctor. It’s highly portable, and very approachable. Because of the battery inside of this unit, you’re well-equipped for jumpstarts as well. Though the Doctor can’t do everything, it’s an incredibly good value for people who are looking specifically for battery recovery features. Finally, the KeyLine Chargers Isolator VSR Kit is about as hands-on as isolators can be. If you want real control over your battery power, you’re going to have to be willing to go through the trouble of installing it. For what it is, this kit is terrifically cost effective. 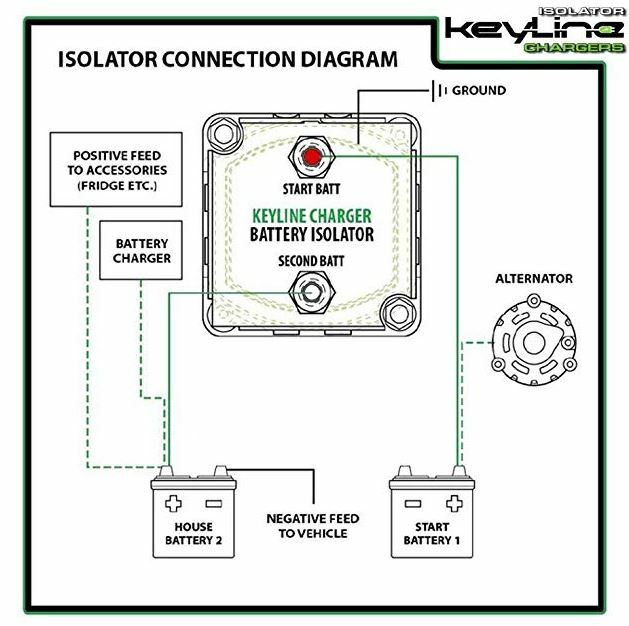 That makes the KeyLine Charger Isolator a good choice for anyone who’s looking for quality above all else.